The tiger prawns were so fresh that I didn’t need any more seasonings except garlic and butter, with salt and pepper of course. The prawns are so delicious. Chinese New Year is just around the corner. Are you still searching for ideas of planning Chinese New Year menu? Here comes a good one to put on your menu. Well, this dish is also suitable for any days throughout the year. It’s a no-brainer dish and quick to be done. Not only is this dish flavoursome, but also it’s full of nutrients. These large tiger prawns I used were so big. From head to tail, it’s long as my palm. They were so fresh that I didn’t need any more seasonings except garlic and butter, with salt and pepper of course. Since I love more flavours developed in this dish, I pan-fried the prawn with shells on. 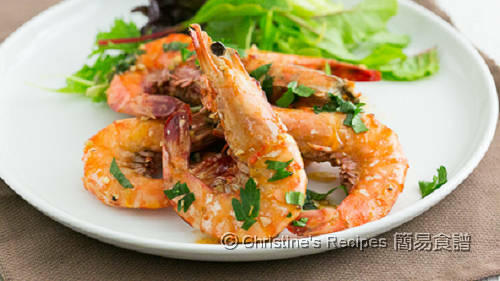 Yet, you may shell the prawns before cooking for convenience if you have young kids at home. With a pair of scissors, trim away the sharp point head and legs. The cut open the shells along the backs. Use a knife to cut a shallow slit into the meat. Devein and rinse. Pat dry with kitchen towels. Set aside. Heat oil in a frying pan. Add half of the butter. Pan-fry the prawns, about 4 mins on one side. Flip over to the other side and cook about 2 minutes. Don’t over cook them, or else the meat turns tough. Add garlic. Pour in wine. Add the remaining butter. Cover and cook for 1 minutes, or until the prawns are just cooked though. Season with salt and pepper. Sprinkle parsley for garnish. Serve immediately. By heating some oil with butter, it helps the butter not to burn too quickly. The taste of this dish will be enriched with frying the shells together. 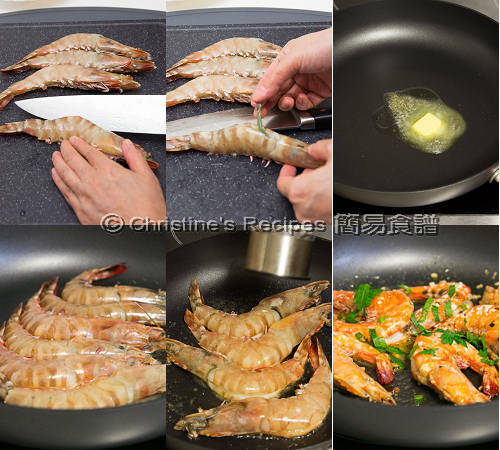 For convenience, you may shell the prawns before cooking. The amount of butter can be adjust to your preference. Either unsalted or regular butter will work. The prawns I used were very large with shells. So I cover the pan and cook for a little while to help the inside cook through. 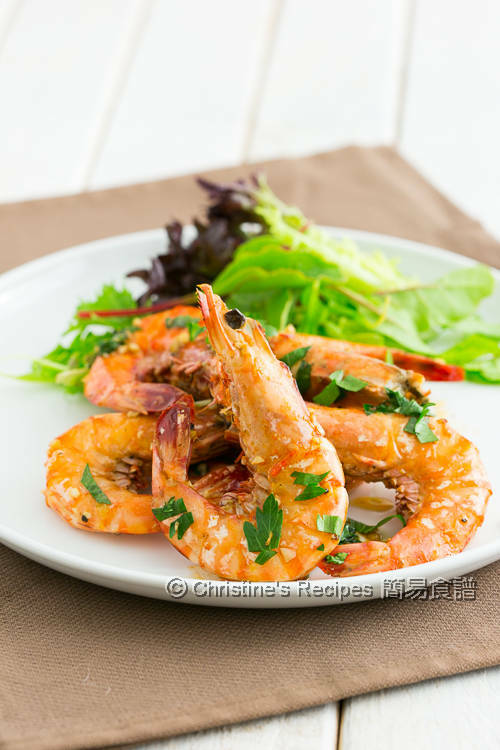 If you use smaller prawns, you may skip this step. If the prawn meat doesn’t sticky to the shell, it’s cooked through. I used Chardonnay, a kind of dry white wine. You may use any wine you like. They look so GOOD! Wish I could get some quality tiger prawns with reasonable price over here. Thanks for this simple yet delicious recipe!